On Saturday evening after dinner, we caught this gorgeous sunset. 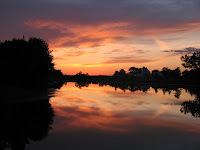 This entry was posted in Uncategorized and tagged bed and breakfast, lake, Mission Oak Inn, relaxation, sunset by admin. Bookmark the permalink.